Our vitamin fortified apple drink is just the drink that you will want to have with your breakfast. Apple drink is a great item to take with you on camping trips and backpacking trips. This drink mixes up really easy and it is easy to pack. Apple drink is a great drink that can compliment any meal including breakfast. This is a need for your long term food storage needs. 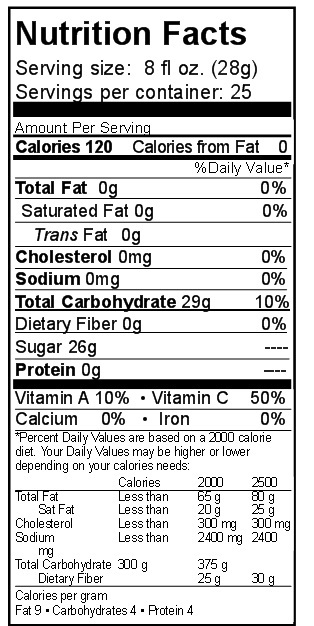 Ingredients: Sugar, Malic acid, Natural and Artifical Flavor, Vitamin C, Caramel Color, Niacin, Vitamin E, Zinc, Vitamin B12, Vitamin B6, Vitamin A, Folic Acid, Vitamin D3, Biotin. Apple drink is a vitamin fortified drink that is great to have on hand. Have it for breakfast, use it for backpacking trips or camp outs. Apple drink is a great addition to your long term food supplies. Directions: To make one quart, add ½ cup rounded cup of mix to 1 quart of cold water. Mix well and allow to chill. Yields 4 one cup servings. Proportions may be altered to suit taste.